Fady Salah | April 26, 2013 On the eve of Mubarak’s departure, Al-Jazeera : ‘The army should form a new ‘patriotic’ government led by a ‘patriotic’ figure, be it Omar Suleiman or Ahmed Shafiq or any other ‘patriotic’ figure to lead the transitional period.’ said Abdel Moneim Aboul Fotouh, then a leading member of the Muslim Brotherhood (MB). April 2012, Al-Jazeera : ‘Omar Suleiman led negotiations with the political forces that betrayed the revolution during its peak, in order for Mubarak to remain in power. I am against the candidacy of anyone who worked with the former regime because the least they have done is remain silent before the corruption of Mubarak.’ said Abdel Moneim Aboul Fotouh, then a leading MB figure and a possible presidential candidate. April 2012, Al-Mehwar: ‘The Muslim Brotherhood is my precious home that I am honored to belong to… I would only resign if I decide to run for the presidency. However, this resignation would be an administrative and not an ideological one, as no one can change his principles and ideologies.’ said Abdel Moneim Aboul Fotouh, a leading MB figure and a possible presidential candidate. May 2012, CBC: ‘The Muslim Brotherhood is nothing but a tool to reach the aim of moderate Islamic rule. Those who hurt me the most were in fact members of the Muslim Brotherhood.’ said Abdel Moneim Aboul Fotouh, presidential candidate and a former leading figure of the MB. 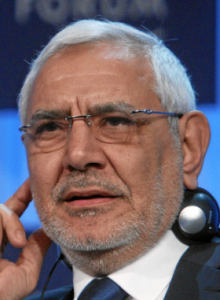 According to a bio in the Egyptian Independent, Dr. Aboul Fotouh is an Egyptian physician who is a syndicate leader in the Arab Doctors Union. He is also a former leader since his student days in the Jama’a al-Islamiya, the Egyptian terrorist group whose spiritual leader was cleric Omar Abdel-Rahman– the so called “Blind Sheikh” now imprisoned in the US for his role in the 1st World Trade Center bombing. When former Egyptian president Anwar Sadat released Muslim Brotherhood leaders from prison in the 1970’s, these same leaders approached Dr. Aboul Fotouh and persuaded him and his peers to join the flagging Brotherhood where he eventually rose to a leadership position.